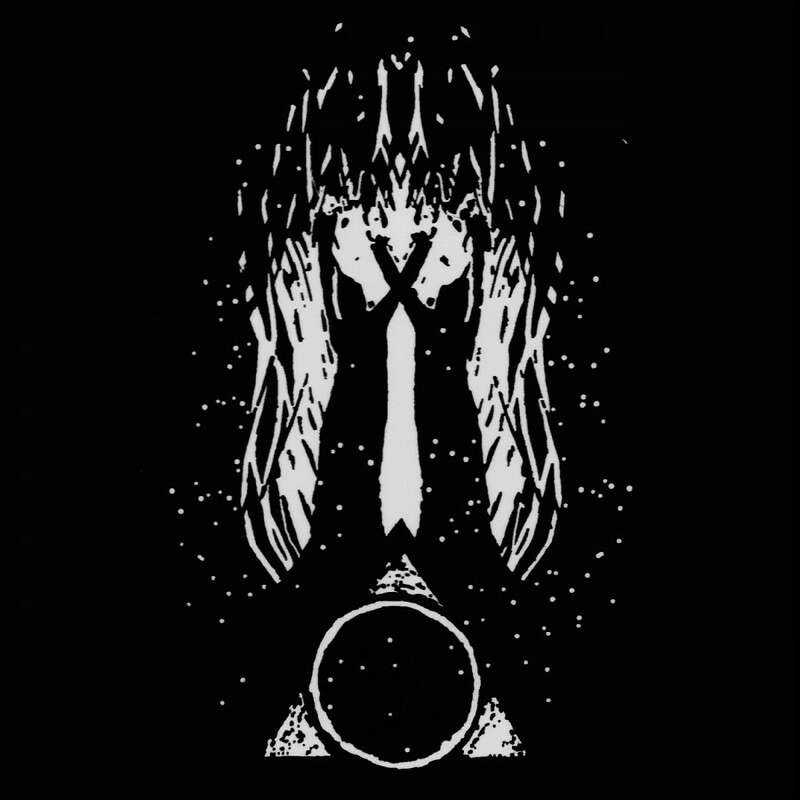 In only its first year, Hypnagoga Press has shown itself to be a leading label within the dark/ritual ambient genre in terms of quality of packaging, innovation of sounds and breadth of focus. The young label is run by Pär and Åsa Boström, the two siblings from the central/northern realms of Sweden. The label has a multi-dimensional set of goals. So far they have delivered three musical releases and three ultra-high quality pamphlets/zines. In the second edition of The Solar Zine they introduced to us Altarmang, a new project between Pär Boström and fellow Umean, Kenneth Hansson; their debut release coming on a c40 cassette packaged exclusively with The Solar Zine vol.2. 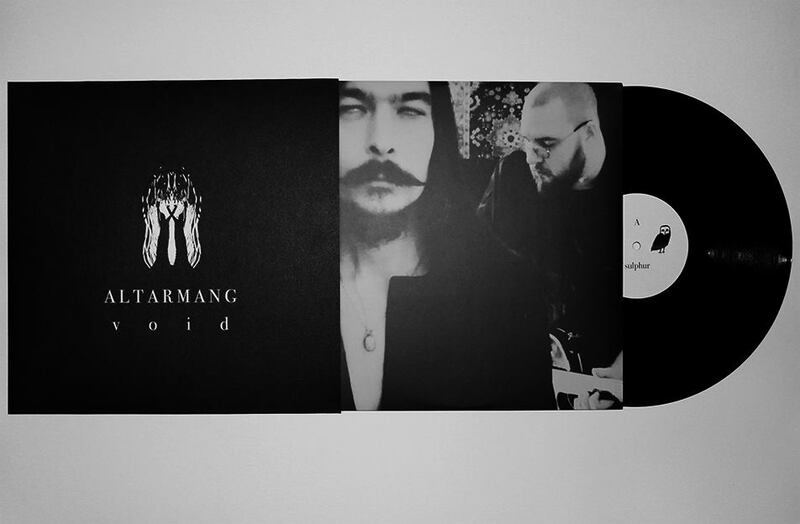 Altarmang made quite an impression on label heads involved in the dark ambient music scene. It wasn’t long before the Altarmang debut was offered an irresistible proposition. Their debut was quickly adopted for a second pressing by the Lithuanian label Autarkeia. Autarkeia is already well known for its deluxe and highly unique re-releases and Void is no exception. Void is now available in a limited edition of 250 copies on heavy black vinyl. It comes beautifully packaged in a sleek black and white outer jacket with a full colour inner jacket which features images of Pär and Kenneth. As far as vinyl releases go, this is one of the more interesting and well prepared packages that I have seen. While the vinyl itself is solid black, with no variant color options, the packaging is quite beautiful, crafted of high-quality materials. It easily reflects the high standards that Pär and Åsa have set for their output. The music of Altarmang, much like its members Pär and Kenneth, is eccentric, esoteric and crafted with the most unlikely of techniques. Each of its two tracks comes in at nearly 20 minutes, which makes it a perfect fit for a vinyl release. Over this forty minutes of music, listeners are urged to follow these artists into a deep trance-like state. The music is easily enjoyable in its own right, but it is an exceptional tool for meditation purposes. From what I have gathered, Pär and Kenneth spent as much time during the creation process honing their mindsets and opening their third-eyes as they did on the actual crafting of the sounds. With each track being approximately twenty minutes, one may choose either side of the LP to use as a tool for a meditation session. In the creation process, Pär’s primary goal is the manipulation of sounds. Much of the album consists of guitar and synth drones which have been twisted and warped by various means. Kenneth brings his knowledge as a reel to reel tape enthusiast to the project. He is able to take the initial soundscapes that Pär has created and run them through these antique machines to change them into something that sounds quite hypnotic, and at times almost disturbing and even daemonic. Kenneth’s second contribution to the project comes in the form of his breadth of knowledge as an herbalist. Filling the studio space with clouds of smoke in varied combinations, Kenneth helped Pär to tap into a deep and primal state of mind, making the ritualistic creation of this meditative music have an ever more dense concentration of spiritual energy. Side A, “Sulphur”, is the more active of the two tracks. It starts off calmly with what I assume to be heavily manipulated analog synthesizer sounds. As the track progresses an electric guitar is used in an increasingly bold manner. Focusing on these sounds during a deep state of meditation, the guitar helps to pull the listener into a deeper level of consciousness and meditation. I have been told that the artists used a blend of essential oils, The Oil of Abramelin, as a dot on their foreheads to help awaken the third eye, I have also mixed a batch of this for my meditative sessions and found it very beneficial. Side B, “Aether”, is a more subtle and relaxed experience. The music is more heavily focused on the synthesizer elements and doesn’t come to a high energy climax in the same way as “Sulphur”. This track is more suitable for meditative sessions that focus of calmness and reflection. Of course, the album is perfectly interesting on its own, sans meditation. The sounds, even on “Sulphur” never become so active as to distract the listener from some other primary goal, such as reading, gaming, studying, etc. But, just as the sounds lend themselves so well to meditation, listeners will also find that a traditional listening session can be quite fruitful and enjoyable. I would recommend this album to any fans of ritual ambient, especially those that lean toward the styles presented on the Aural Hypnox label. While the album is available for download through the Hypnagoga Press Bandcamp page, this latest release on vinyl through Autarkeia is really beautiful and well prepared. It will be a great addition to any fan’s record collection.